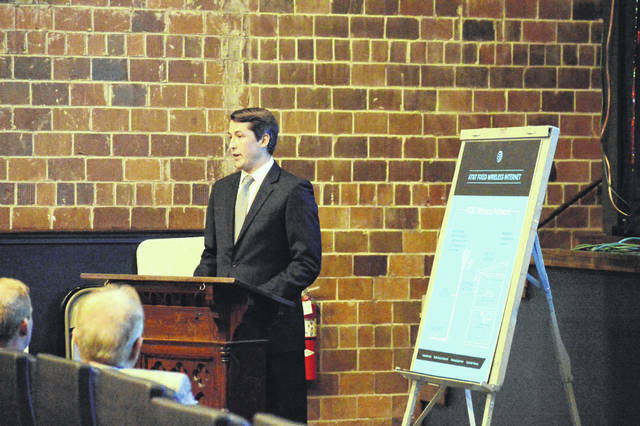 Brad McLean, AT&T Director of Governmental Affairs, shares At&T’s new internet initiative with visitors, media and area dignitaries in the Colony Club in Gallipolis Tuesday. GALLIPOLIS — AT&T Ohio announced Tuesday afternoon a new program is going to spread high-speed internet into more rural areas throughout Gallia County. https://www.mydailytribune.com/wp-content/uploads/sites/42/2017/10/web1_DSC_0233.jpgBrad McLean, AT&T Director of Governmental Affairs, shares At&T’s new internet initiative with visitors, media and area dignitaries in the Colony Club in Gallipolis Tuesday.